From the Publisher: Aboard the Starship Shenzhou, Lieutenant Michael Burnham, a human woman raised and educated among Vulcans, is promoted to acting first officer. But if she wants to keep the job, she must prove to Captain Philippa Georgiou that she deserves to have it. She gets her chance when the Shenzhou must protect a Federation colony that is under attack by an ancient alien vessel that has surfaced from the deepest fathoms of the planet’s dark, uncharted sea. As the menace from this mysterious vessel grows stronger, Starfleet declares the colony expendable in the name of halting the threat. To save thousands of innocent lives, Burnham must infiltrate the alien ship. But to do so, she needs to face the truth of her troubled past, and seek the aid of a man she has tried to avoid her entire life—until now. 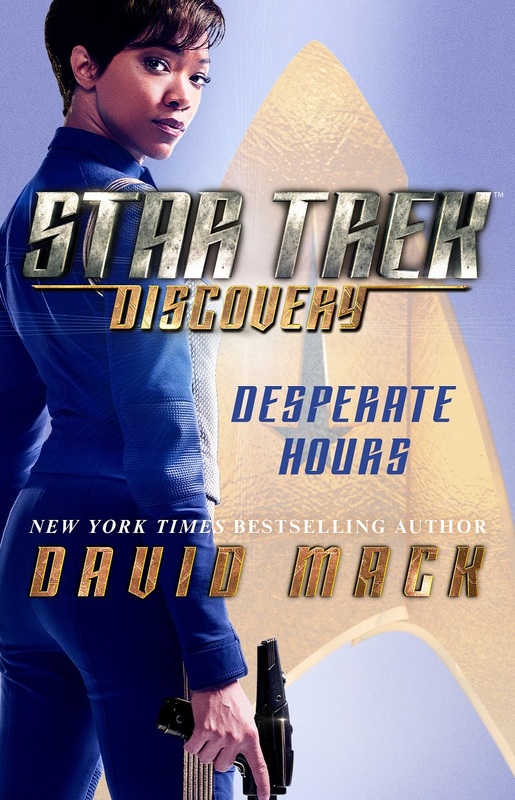 So, the honor of writing the very first Star Trek Discovery tie-in novel was bestowed upon David Mack, and, IMO, he did not disappoint. Mack worked closely with the creators and writers of Discovery while they were all working towards their goals, and the resulting novel is not only an excellent companion piece, but serves to tie some more Trek history together. “Desperate Hours” is set one year prior to Discovery‘s two-part pilot, and Michael Burnham has just been promoted (over Lt. Saru) to the role of Acting First Officer at the recommendation of Starfleet Command, but Captain Georgiou will be the one determining whether she keeps the job. And of course, that’s when the Shenzhou embarks on an incredibly challenging mission – and ancient alien craft has risen from beneath the seabed on a planet with a Federation colony, and has begun attacking. Well, they’re kind of a Federation colony – they don’t really want much to do with the Federation, and they’re sponsored by a mining/drilling company, but still have declared themselves Independent, and must therefore operate under Federation law in Federation space. It pains the colonists to admit that they have to ask Starfleet for help, and they are dreading such involvement. As if relations weren’t strained enough, Captain Pike’s Enterprise arrives shortly after the Shenzhou, bearing orders from Starfleet declaring the colony and the planet expendable, if it means defeating this alien force. This is a story set before a show that just premiered. We know that the characters and ships we see in the pilot are going to make it through the ordeal in this book. But, for me, that doesn’t detract from the tension or suspense whatsoever – there is excellent pacing and even better character development. And that’s what this novel needed to be: A way for us to get to know these new characters and their relationships on a deeper level, and Mack accomplishes this goal by teaming them with the characters that we already know. The opening of the novel shows a much more contentious relationship between Burnham and Saru than we see in the opening of “A Vulcan Hello.” These have gone toe to toe since Burnham joined the crew, competing for the same assignments, accolades, positions, and even the attention and mentorship of the Captain. And we find both of them contemplating their insecurities and their worth. But, in dealing with the Juggernaut threatening civilians and the presence of the uninvited Enterprise, Burnham reaches out to Spock to help her investigate. Similarly, Saru finds himself working alongside Una, aka Majel’s Number One (and ya’ll know I’m a sucker for Number One). All while Georgiou squares off against Pike. Spock and Michael have a strained relationship, one filled with a lot of emotion, resentment, and jealousy surrounding their own relationships (and perceptions of those relationships) with Sarek and Amanda. But through working together, they are forced to explore these uncomfortable memories, and come to understand both one another and themselves more, grounding them both. On his mission Saru finds himself intrigued and maybe a little infatuated with Una, and decides that he wants to emulate her approach. And Georgiou and Pike are able to find a way to carryout their orders without “glassing” an entire planet. Also, we getting little tips-of-the-hat to the changes made for Discovery. There are quite a few mentions of the differences in uniforms and technology. Spock’s encounter with Burnham is even said to have changed him by the end of the mission, potentionally accounting for the character differences we see between Star Trek‘s original pilot and the series as it aired. Additionally, Mack continues the theme presented in a lot of recent Trek media that not everyone is happy with the Federation and their practices. This will clearly be explored on the show, but here we have a colony with a governor appointed by what is essentially an oil company, acting in their own best interest, distrusting of the Federation. It’s an interesting road to go down in Star Trek. Clearly, I very much enjoyed this novel. And I hope that there are more stories in this era, and Georgiou has clearly made an impact on so many fans so early in the run of the show. From my research, the next Discovery novel is in the hands of Dayton Ward, is said to be set 10 years before “A Vulcan Hello,” and has an expected publishing date of December 2018. If all off that is accurate, we’ve got a while to wait. “Desperate Hours” was published on September 26, 2016 with an MSRP of $16.00 US. It is available in large format paperback on Amazon, or at your local retailer. Ebook and audiobook formats are also available. Overall I enjoyed the book, but the 9 million year old star ship was ridiculous. And I don’t think Mack got Burnham quite right. At least, not as she’s portrayed by Sonequa, which is so beautifully badass. And Spock is such a tiresome Mary Sue. Just added to my Christmas list!! Thank you! !